Piercy’s money measures to date have been much less successful than Torrey’s. She has only won if she was renewing an old Torrey measure (Library and Parks) or placing a measure driven by the 2008 Torrey campaign on the ballot (two streets bonds). There are several possible explanations. Most probably, this could either imply her support is much lower than Torrey’s was, and polling shows that this is true, or this could imply she is trying to reach too far. It is most likely that some combination of these is true. These patterns could have some impact on the upcoming library measure. Under other circumstances it would be seen as a safe win. The Library and Park measures in 2006 were extensions of the 1998 measures. They were reasonably similar. They provide a unique comparison between the two mayors. As can be seen, there was a significant drop in support between 1998 and 2006 for both measures. There were a number of differences between the measures. It’s not clear if they helped or hindered the 2006 measures. For example, new measures, as both 1998 measures were, tend to do less well than renewals with a track record. Torrey initiated a whole set of novel measures. These include the youth activity measures and the parks and library measures. Piercy’s record becomes worse when the measures are broken up. Two of her four wins are renewals of Torrey measures (Library and Parks in November, 2006). Her other two wins are street repair measures. These were responses to the 2008 Torrey for Mayor campaign. Her own proposed 2007 Gas Tax measure failed in a landslide. In other words, her four wins to date have all been heavily influenced by Torrey and her original ideas have failed. Piercy’s losses were the gas tax, urban renewal, school income tax, and service fee. How Does Kitty Piercy’s Money Measure Success Stack Up with Jim Torrey’s? This post reviews all the money measures during Jim Torrey’s two terms as mayor and under Kitty Piercy’s two terms plus. Torrey’s winning percentage was much higher, at 77 percent. Piercy’s to date is at 50 percent. … but, this doesn’t tell the whole story. Category: Eugene and Lane County, Political | Comments Off on How Does Kitty Piercy’s Money Measure Success Stack Up with Jim Torrey’s? 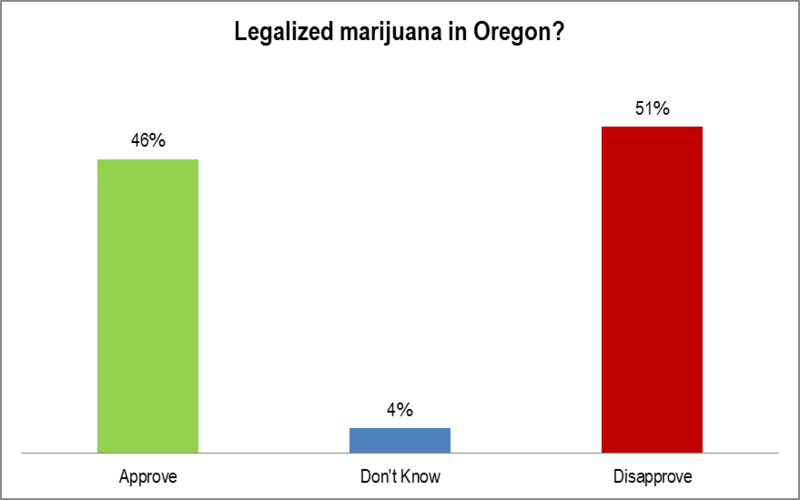 Oregonians disapprove of how the state is handling the process of legalizing marijuana by a slight margin. This could be what is causing the buyer’s remorse. 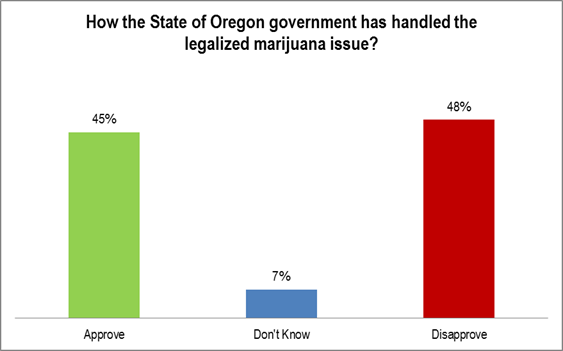 QUESTION: Do you approve or disapprove of how the State of Oregon government has handled the legalized marijuana issue? Legalized marijuana is now disapproved in Oregon by a small margin. 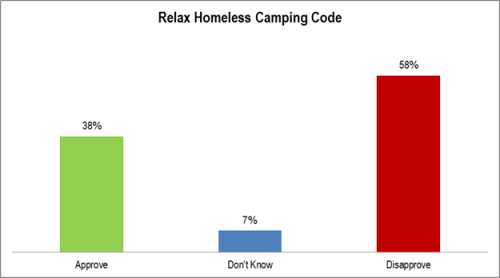 QUESTION: Do you approve or disapprove of he City of Eugene relaxing code enforcement on homeless camping? 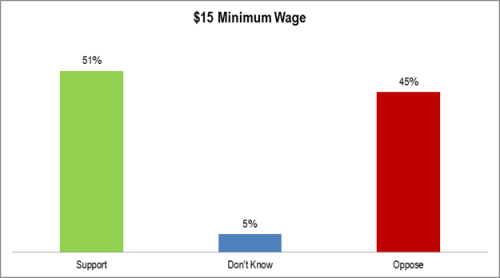 There is significant opposition to a $15/hour statewide minimum wage. 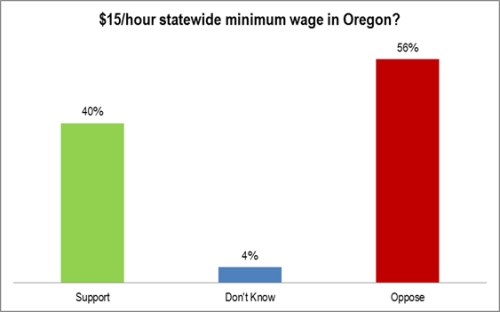 QUESTION: Do you support or oppose a $15/hour statewide minimum wage in Oregon? IF SUPPORT/OPPOSE: Is that strongly or somewhat? IF DON’T KNOW: Which way do you lean? Eugeneans support a $15/hour minimum wage. The support is not strong. It is slightly less than the margin of error and is just above 50%. The LTD payroll tax is supported, but the margin is less than the margin of error and the level of support is far below 50%. 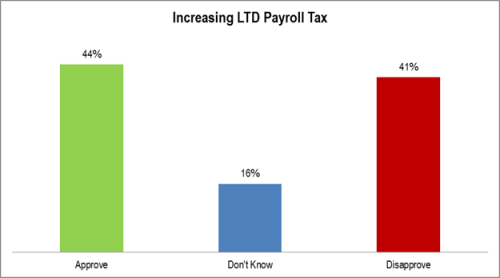 QUESTION: Do you approve or disapprove of Lane Transit District increasing its payroll tax from $7 per $1,000 payroll to $8 per $1,000 payroll over the next ten years?